This "Historically Speaking" column was published in the Exeter News-Letter on Friday, February 16, 2018. Some of Exeter's most notable citizens didn't live in town very long. Daniel Chester French, famed sculptor of the Lincoln Memorial was born in Exeter, but moved with his family when he was 10 years old. Even our founder, the Reverend John Wheelwright, tarried in town only four years. Such is the case with Dr. Irene May Morse. In 2013, the Exeter Historical Society was contacted by Barbara Pulaski, a sociologist at Mount Ida College. Pulaski was conducting studies on the industrialization of Clinton, Massachusetts, her home town, when she came across the name "Dr. Irene Morse." Curious, she began looking into the life of Dr. Morse. "I became intrigued because few females were physicians at that time - she first arrived in Clinton in 1908." Dr. Morse worked at the Clinton Hospital, where she served as superintendent. Pulaski wrote of Morse, "in the year 1909, the Clinton Hospital contained thirty beds. The nursing program had been established and sixteen student nurses were in training in 1909. By1912, the capacity of the hospital was increased to fifty patients with the development of a new ward." Morse also served as medical director of the Tuberculosis Camp of the Clinton Association for the Relief and Control of Tuberculosis and, in 1912, was in charge when the entire hospital was placed on small pox quarantine.In addition to serving in these capacities -as well as being an attending physician - Dr. Morse was also skilled at "etherizing" during surgical procedures as well as serving as a pathologist in the lab. At the outbreak of World War I, Irene Morse was one of the first physicians from Clinton to volunteer service overseas. She's mentioned in the New York Times as working with the Women's Overseas Hospital, which was supported by the American Woman Suffrage Association. Oddly, she's listed as being from Wyoming. Intending to deploy immediately, she ran into a snag when applying for a passport. It seems she had some difficulty providing a birth certificate. Affidavits were obtained from several high-ranking physicians who attested to her character and had no reservations in believing she was born in Providence, Rhode Island on June 17, 1867, as she said. She was granted a passport and arrived in France in August of 1918, where she worked with victims of poisoned gas. By December, she was invalided home - a victim herself of a gas attack. The French Government awarded her the Medaille d'Honneur for her work with injured soldiers. She returned to Clinton and worked quietly at the hospital for the remainder of her years. She died at the Clinton Hospital in 1933, her lingering pulmonary issues having never fully healed. 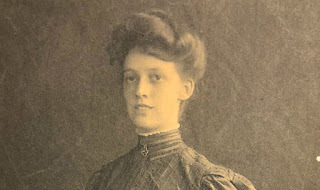 Pulaski was able to piece together Morse's life - from the time she first went abroad to study in Europe in 1888, through her brief teaching career at Young State University of Wyoming, where her suffrage leanings took hold and her medical studies at Tufts University. So, with a trail that seemed to start in Rhode Island, the American West, Europe and finally Massachusetts, why is Dr. Irene May Morse buried in the Exeter Cemetery with the family of Asenath Darling? "This is my problem," Pulaski wrote, "She just does not exist before 1888." 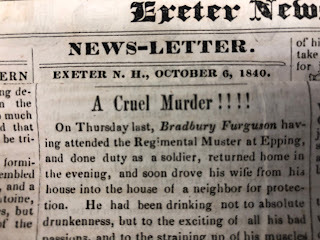 Our first hint at an Exeter connection is a brief mention in the Exeter News-Letter in September of 1918 - a notice that she'd left for the war. "Dr. Irene M. Morse, of Clinton, Mass., who was partly reared by friends in Exeter and is an alumnus, but not a graduate of Robinson Female Seminary, is, says Ethel Armes in last Sunday's Boston Herald, the first woman physician of New England to go to France." There were so many hints in this brief sentence, but all our attempts to find her in the records of the Robinson Female Seminary fell short. Irene Morse was a mystery woman. Part of the difficulty would prove to be the way she listed her name. She might be "Irene" or "Rena" or "Iren" at various times. Searching though the census records in 1870, there was a listing for "Rena Morse" age 3, living with her parents, Charles and Mary, in Providence, Rhode Island. We located her in the 1880 census living with the Colbath family in Exeter, again listed as "Rena Morse." Laura Colbath was a teacher at the Robinson Female Seminary in 1876. Morse must have been living with the Darling family when she first arrived in town. Rhode Island records show that her own family fell apart in 1877 when Mary Morse unexpectedly died at age 35. At that time, the Seminary had a quaint custom of having all incoming students sign the big admission book. There, in clear but childlike script, 11 year old Irene Morse signed the admission book as "Rena May Darling" perhaps expecting to be adopted by Manly and Asenath Darling. Asenath's sister, Jennie Harvey, was also a local teacher and she took a deep interest in young Rena. The two were close for the remainder of their lives, Jennie leaving her part of her estate in her will. By all accounts a brilliant student, Morse finished her work at the Seminary in 1881and went on to the Salem Normal School, teaching school to support herself through the rest of her studies. When the war broke out in 1918, Dr. Irene Morse was 51 years old but as always, she was up to the challenge of the wartime medical corps and unafraid to embark on such a major endeavor. The News-Letter commented, "Dr. Morse was a woman of exceptionally fine mind, generous, affectionate and brave. No soldier, who died on the battlefield, gave his life for his country more truly than did she." There are heroes buried in the Exeter Cemetery - Dr. Irene Morse, who chose Exeter for her final resting place, is one. 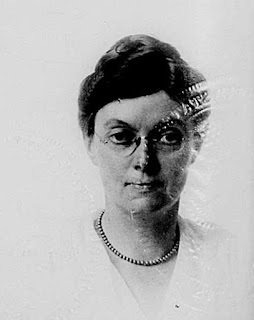 Photo: Dr. Irene May Morse, photo from her passport application in 1918. Dr. Morse attended the Robinson Female Seminary in Exeter from 1878 – 1881.